So I picked up a roller controller recently and found that "down" doesn't work. When you roll the ball in the down direction, the icon on the screen goes up. Up, left and right work fine. I thought this may just be an issue with the rollers inside the controller, so I cleaned those and oiled the bearings. The controller feels nice and smooth now, but it didn't fix the issue. I cleaned the optical sensors as well with no luck. I did notice that a couple of the bearings were starting to rust, so it's possible this thing was exposed to water at some point. Anyone familiar enough with these things to know where to look for the issue? I've read that sometimes the optical sensors go bad, and perfect replacement parts are hard to find. I've had several with similar problems, but I've never tried to fix one. I'm guessing it's probably the sensor. I did view it with my phones camera and saw both channels on the optical switch light up, but that doesn't necessarily mean it's working. 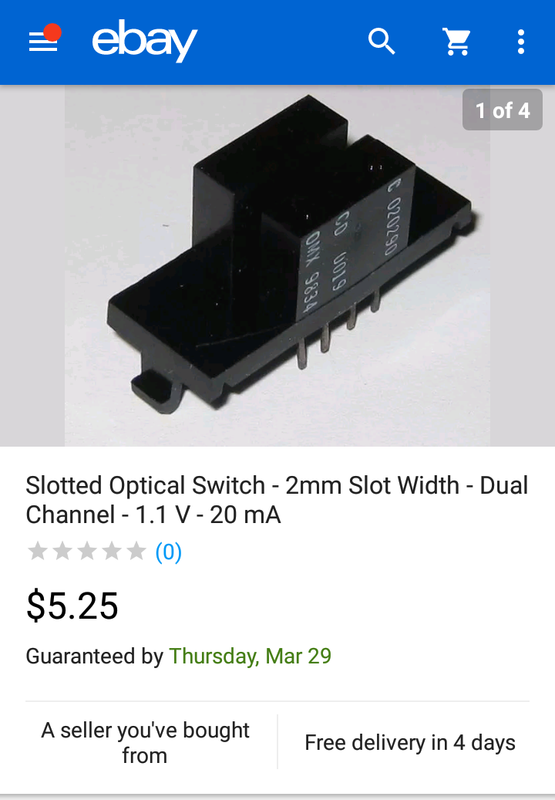 I did find someone selling dual channel, slotted optical switches, which at least size-wise look like they're compatible. If they work, I'll post a link. Check the electrical continuity through the cable and connectors. I think it uses pins 7 and 9 on both connectors. Checked for continuity through the cables and everything checked out. Also inspected for cold solder joints and found nothing questionable. Huzzah! It's alive. Replaced the optical sensor with the closest match i could find and it's back in business. I'll include a screenshot of the switch i purchased if anyone is interested. You will need to trim the tabs off the sides for it to fit. Woah. That's awesome. I think I asked about this a couple years ago and got the "Parts no longer available" answer. I have one of these that has dodgy optical sensors. I'm going to go find me that part. Ok so I ordered 2 of the optical sensors and it did not fix my issue. I did a search and found some schematics for the roller controller. So I broke out my multi-meter and began to test pins. used the known working sensor and compared the voltages on the IC inputs and outputs for each sensor according to the schematics. (I have a little background in electronics so I can reasonably understand the circuits.) When spinning the optical roller I did see a Hig/Low or 5v/0v signals where there should be. I noticed even on the one I replaced it was also reading fine so I don't think the sensor that i replaced is bad. I traced it down to pin 9 of the actual 9 pin connector (From the board to the connectors end). Since it is molded plastic I can not open it to see if a pin came loose or a solder joint is broken. I could not get any continuity until I cut off the end and striped the pin 9 wire. So I am ordering some db9 connectors and I am going to replace both connectors. I will update this thread as soon as I get the parts. It would be easier just to solder a cord from another unit but I dont have one...lol. Did you ever get any resolution on this? Yes. 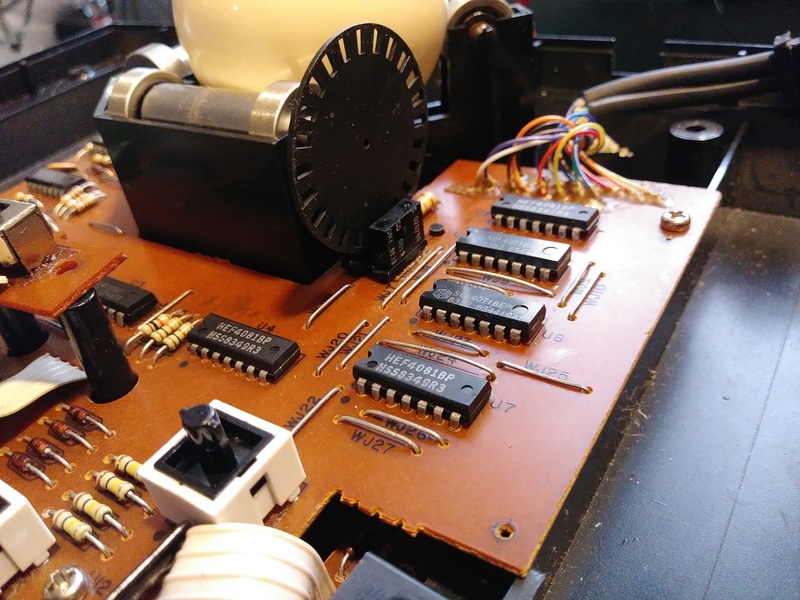 I used a multi meter and did a continuity check between each of the 9 pins in the connector against the points soldered to the board and found one of the pins had an open. I cut the connector off and replaced it with https://smile.amazon...0?ie=UTF8&psc=1 and it now works. I do have a few extra optical sensors I picked up on eBay in case someone thinks it could fix their issue I would gladly sell (cheap) But I only have 5 I think. Have to look. I just got a bronken Roller Controller today. Cleaning the motherboard now but it looks like one of the optical sensors is bad. That eBay auction doesn't look like it is available . Any other source for these? I did and they said they didn't have any additional. HI, I have one roller controller that only works horizontally. Vertically cursor only makes very short jittering moves.. I have tried to find the schematics without luck, link on previous post does not work either. Also I could not find the part shown in the pic above on ebay or anywhere. Is there a part number?I would appreciate any help I can get on this little project. The controller is worth rescuing cosmetically. I am not sure if it is the sensor or some IC. thanks a lot in advance! Edited by alortegac, Sat Dec 15, 2018 12:43 PM. My roller controller works ok but I rarely use it in fear of it going bad. Hopefully new ones may be in the works or planned as far as the expansion port goes on the Collectorvision Phoenix. Often its not all 4 sensors that go bad so I wonder how much trouble itd be to take parts from a broken one to replace on another to make one working unit. But perhaps sensors work fine & issue may be elsewhere along the circuit. Each direction/sensor is mapped to certain pins at the end so tracing voltage from sensor to pin should pinpoint issue. Maybe also visually inspect exposed cable wire connections to board as those thin exposed wires can get quite brittle over time & get separated. This of course requires knowledge of the pins on the dual switch that was originally used, as the new one may not be directly pin compatible. Hi, thanks for your response. I think it is a sensor or an ic related to the vertical axis. Without schematics I do not know which IC to check on first. Taking parts from another one is fairly possible, but I only have one unit. Thanks for your help! Edited by alortegac, Sun Dec 16, 2018 7:30 AM. Edited by alortegac, Sun Dec 16, 2018 7:47 AM. I found this part that looks similar....I am not sure about the pin out of the original. Any suggestions? Edited by alortegac, Sun Dec 16, 2018 8:02 AM. I think you'd have some issues making that work. That schematic is a bit confusing. It shows plug pins for OS2 but not for OS1. It also doesn't really indicate whether the resistor is integral or a separate component on the sensor. It does seem nontrivial to use separate switches as suggested. Someone who knows the sensor itself could probably rig one up using a couple surface-mount optical switches on a custom PCB though. It's also interesting--according to that schematic it doesn't use pins 7 or 9 which are made for the SAC roller setup. Instead they have it set up to work like a joystick. The resistor is a separate component. OS2 is mounted to a small board, connected to the main through a 4 wire flat cable. I think we must find a substitute part to be able to repair effectively, a dual channel opto sensor. There also significant dimesional challenges to consider. I checked the circuit with the logic probe and I am certain it is the sensor at fault. Half of the signal going to U1 is dead. Any suggestions on substitute parts are welcome! Thanks to other fellow aa members I was able to repair this controller. Thanks a lot!